HPAKANT, Kachin State —About three hours outside of Myitkyina, I realized I was traveling on the worst road I have ever taken. It was a red-dirt road riddled with huge pot holes that could easily overturn a carelessly driven truck. My destination was Hpakant, the jade town just 60 miles from the state capital, but it took the whole day to get there. Located about 220 miles north of Mandalay, Hpakant is famous for producing the world’s highest-quality jade. It’s a journey the Burmese government has long banned foreigners from making, although traders from China—where most of the jade ends up—often make it there. The extraction of the region’s earth-bound riches has utterly transformed the landscape. 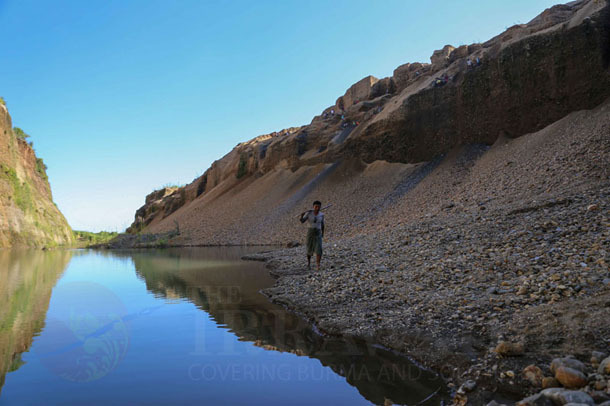 The local environment has been wrecked by large-scale jade mining companies, mostly affiliated with the Union of Myanmar Economic Holdings Ltd. (UMEHL), a Burmese military-run conglomerate that dominates many sectors of Burma’s economy. When we arrived, I felt I was entering a construction site, rather than a town. I saw two-story high piles of tailings—the refuse left once jade is separated from rock. They were left over from mining operations that ceased in June 2011, when fighting broke out between the Kachin Independence Army and government soldiers. Since then, large-scale mining has been suspended, but small-scale miners have come in. On the second day in the area, I witnessed them at work using primitive hand tools to scour the mountains, which are already stripped bare by heavy machinery. Most of the workers are aged somewhere between 18 and their late-thirties. Though they have come from different parts of the country, from Upper Burma to the Irrawaddy Delta, they share a same dream—to get rich. However, they say, that’s not easy. Prospectors point out the town’s rampant drug abuse, numerous gambling dens and widespread prostitution as the main culprits for their failure to fulfill the dream. Plus, they say, small-scale mining is both illegal and highly dangerous for its practitioners, meaning arrest or injury are always a risk. But for these small-scale miners, their hopes remain high. JPaing is a photojournalist working for The Irrawaddy.